Prevent squirrels from reaching your hanging bird feeder using this Galvanized Metal Hanging Squirrel Baffle. 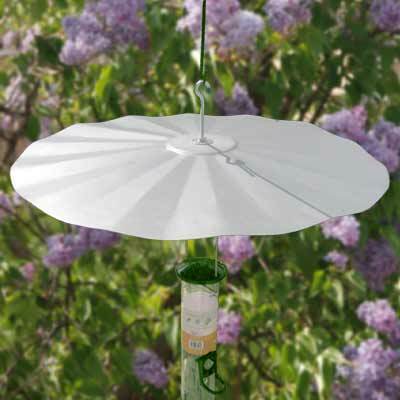 The ruffled edges and significant size of this sturdy guard easily cover your favorite hanging feeder, protecting the seed from squirrels. Its all steel construction and galvanized coating ensure this unit will remain hardy for several seasons, while a slightly raised center section accommodates the included hardware. These robust, threaded rods securely hold the baffle and your feeder, and washers in the center complete the hardware. The gray hue on the unit enhances your yard, and can easily be painted to match your decor. The wavy design lends a touch of fun to this piece. Protect your bird feeder from squirrels with this Galvanized Metal Hanging Squirrel Baffle. Made in the USA. Note: This description refers only to the Galvanized Metal Hanging Squirrel Baffle. The feeder shown is not included.